Breakfast in Florence was much like breakfast in Venice: hard rolls, yogurt, cheese, and coffee. Well, no coffee for me of course. I had daily cups of hot chocolate. At least in Florence, we had fruit to choose from! We toured Santa Croce with our local guide Luka. It’s a beautiful building filled with frescoes by Giotto and his pupils. And, much to Kris’ delight, it contains many tombs. (Kris loves tombs, remember.) However, I’m not sure how many of these tombs were actually tombs — I think many of them were simply monuments. Whatever the case, we saw monuments or tombs for Dante, Machiavelli, Rossini, and three scientists: Galileo, Marconi, and Enrico Fermi. Kris in front of Galileo’s tomb. Or monument. Or whatever. The strike at the Uffizi Gallery ended mid-morning, so we headed over to take in one of the biggest art collections in the world. We saw Botticelli’s The Birth of Venus (which was wonderful), some Michelangelos, and more. But I was tired and hungry and my feet hurt. I was tired of standing in museums and walking with the group at a snail’s pace. Plus, our tour guide Luka — while knowledgeable and nice — rambled on and on with little personality. I felt more and more on edge. To cope, I spent the last 60 to 90 minutes in my own little world, following the group from room to room but listening to classical music on my iPod while pacing the edges of the galleries. Note: I’m complaining a lot in these journals, I know, but truth is truth. I had a great time in Italy, but not everything was perfect. After 24 days of museums, most toured with groups, I’ve come to the conclusion that I need to do museums on my own. This lets me see what I want at my own pace. Groups are great for many things, but viewing art is not one of them. And, as I mentioned at the end of yesterday’s post, I liked the exploration we did in our free time more than the scripts we followed with groups. By the time the tour ended at two, Kris and I were tired, hungry, and snippy. We quickly found a place to eat pizza, wine, and chocolate. We felt much better after lunch. Italian food had a way of improving my mood in a hurry! 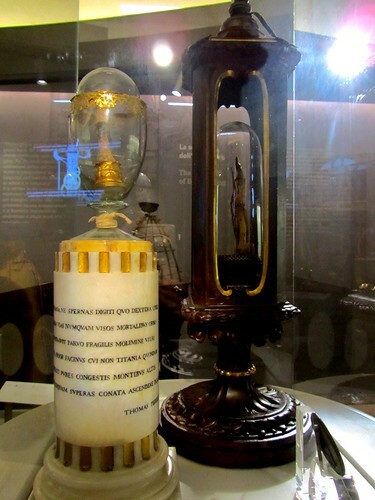 In the afternoon, we toured Museo Galileo, Florence’s science museum. Were I not tired, this would surely have been a trip highlight — especially the globes and the maps of the heavens. Even exhausted, it was fun to see. Kris and I walked back to the hotel, where we had a supper of food from the nearby grocery store. We each picked out little snacks to eat. Kris bought what she thought were little blocks of cheese, but they actually turned out to be blocks of yeast. We were asleep by 8 p.m.
Italian traffic is crazy and chaotic by U.S. standards, especially in Florence. It’s somewhat akin to New York City, I guess. Cars weave lanes, dodging buses. Bicycles crawl along the side — and often down the center — of the street. Scooters (and a few motorcycles) dart in and out of traffic, passing in tight spaces between vehicles. Despite this, everyone seems respectful of pedestrians, stopping to let folks cross. And things flow smoothly. I never felt endangered in Italian traffic, and I saw no accidents. Compare this to France, where traffic is more ordered (though still a bit chaotic) and more dangerous. Nobody in Paris stops for pedestrians, and people honk at cyclists. I saw five accidents in France compared to zero in Italy. Italy’s traffic may be chaotic, but the Italians make it work. You can save SO MUCH money and aggravation by traveling without the group, package deal. It is truly feasible and rewarding anywhere in the world. I’d like to go to this area sometime. Curious about power there & other places in Europe, how’d you keep your ipod charged? I sent you an email about vacation logistics. Probably buried in your inbox. I feel for you, really. Walking slowly gives me a pain too. Usually in my lower back. I’m fine at walking at a normal or fast pace, but not at walking slowly. So now you know to avoid museum group tours. I laughed out loud, at Kris buying the yeast instead of cheese. I hope she didn’t eat them. I have found that I like the group experience for museums. Or, at least, the guided experience. A knowledgeable guide can really make the difference. Listening to recordings on a headset just isn’t the same. The opportunity to ask questions and get personal observations is worth the pain of listening to a few utterly stupid questions. The guided tour I went on at the Galleria Borghese was amazing. Our guide started by giving us a history of the gallery and how it came to be. Then we visited about a dozen works and were given an in-depth analysis of them. For instance, Bernini’s Apollo and Daphne was designed for a specific room and intended approached from the rear so that what is going on is slowly revealed to the viewer. This is not the type of information one normally gets from books or recordings. The downside of the guided experience is that we had little time to see everything else(the Borghese only allows ninety minutes to tour the gallery). Santa Croce was not open when I was in Italy the first time. I remember seeing the work of Cimabue at the Uffizi and thinking how different it was from the other Byzantine art on display. To me, Cimabue’s work seem to stand between Byzantine and Renaissance. It wasn’t until I saw a Cimabue exhibit in Pisa a few years ago that I found out he had drawn on the work of many others in developing his style. And his pupil, Giotto, is credited as being the first Renaissance artist. In most galleries one sees a bunch of Byzantine style paintings followed by Renaissance paintings. It seems Renaissance style arose fully formed from nowhere. But, all over Northern Italy there was a movement to more realism in art that rapidly progressed to the Renaissance style. Well, I digress. Nobody comes here for a lecture on art. And I certainly am not the one to give such a lecture. Yeast is more my speed. Although I didn’t confuse yeast for cheese, I did try to by a bus ticket from what turned out to be a condom vending machine.